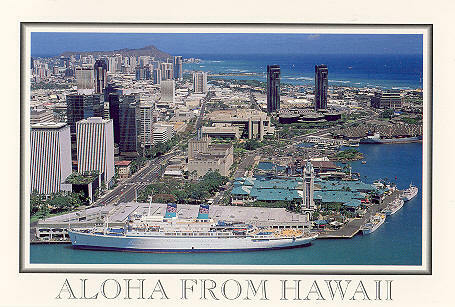 This page is devoted to postcards of the American Hawaii Cruises. An alphabetical list of ships shown on this page is shown below. The Table beneath gives links to complete postcard history pages on selected individual ships. Below the table are official postcards of the fleet in chronological order. 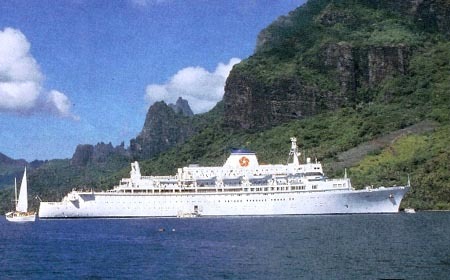 American Hawaii Cruises is part of American Classic Voyages, other subsidiaries being the new United States Lines and Delta Queen Steamboat Co. American Hawaii Cruises and United States Lines filed for bankruptcy in 2001 following poor trading in the wake of the September 11th terrorist attacks. In 1987, the cruise line was bought from the C.Y.Tung group by Peter C.R.Huang for $20million. Peter Huang became president and chief executive of American Hawaii Cruises. he soon withdrew Liberté from service, and she was returned to her owners. Constitution was sold for scrap in 1997, after being laid up for two years, and subsequently lost in the Pacific whilst under tow to the Far East. The quickest way to search this website! 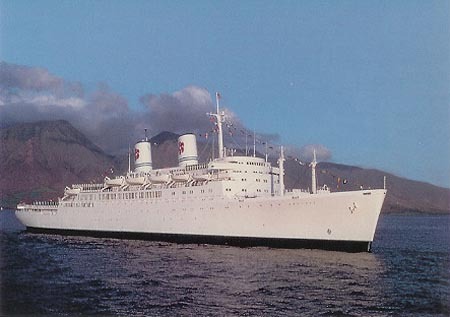 Independence originally entered service on February 11th, 1951, sailing from New York to Gibraltar, Naples and Genoa for American Export Lines. At the time of delivery, she was the fastest American-built liner, achieving over 26 knots. In 1959, she received a major refit, including the the move of her bridge further forward and upwards. 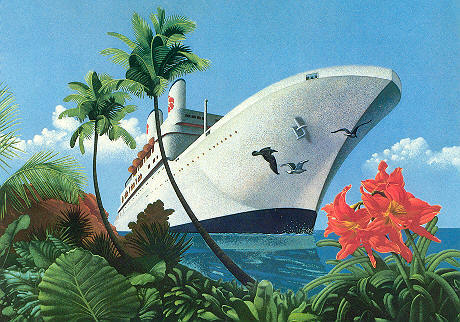 The New York-Italy voyages were increasingly advertised as 21-day cruises during the 1960s. Jet aircraft, union problems, plus competition from newer Italia Line ships made the services uneconomic, and Independence was withdrawn from Atlantic service in 1967. In 1968 she received a garish psychedelic livery, and ran cruises for travel agents called Fugazi to the West Indies and Mediterranean, but these were not a success. I do not have a postcard of Independence in these psychedelic colours. If you can assist, please email:- simplon@simplon.co.uk. 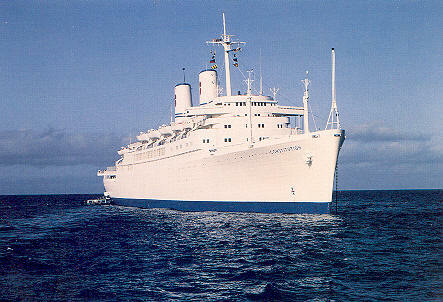 Independence was laid up until 1974, when she was sold to the C.Y.Tung group and renamed Oceanic Independence. 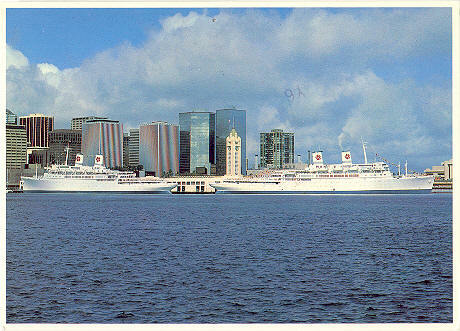 She was briefly used for cruising, but then laid up in Hong Kong as Sea Luck I from 1976. 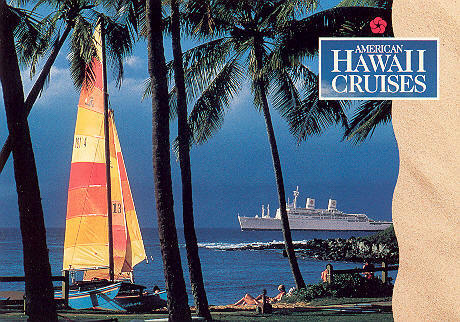 American Hawaii Cruises were formed by C.Y.Tung in 1980, who wished to enter the American cruise scene. 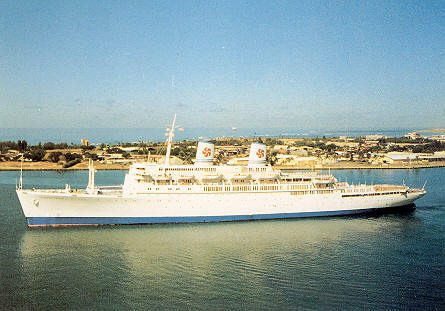 The service started using Oceanic Independence, on 7th June 1980, operating a 7-day cruise out of Honolulu. 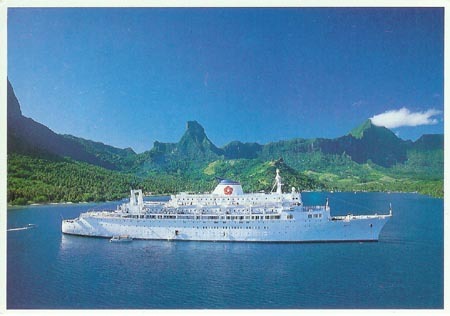 During the winter of 1983, Oceanic Independence received internal refurbishment, returning to service under original name Independence. 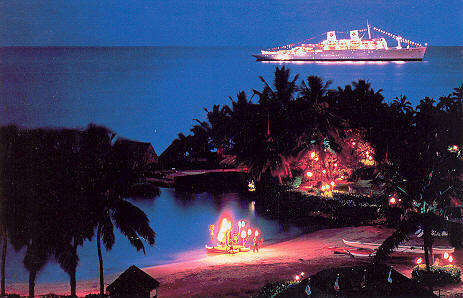 In 1987, the cruise line was bought from the C.Y.Tung group by Peter C.R.Huang for $20million. 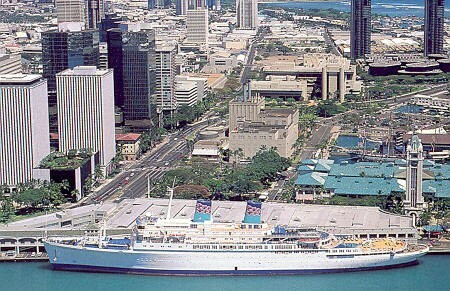 American Hawaii Cruises filed for bankruptcy in 2001 following poor trading in the wake of the September 11th terrorist attacks, and Independence was laid up in San Francisco. A complete postcard history and photographs of Independence is available on this link. Official American Hawaii postcard SC17295 of Oceanic Independence. 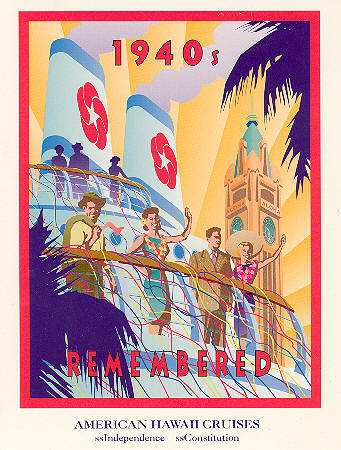 Oversized official American Hawaii postcard of Idependence. 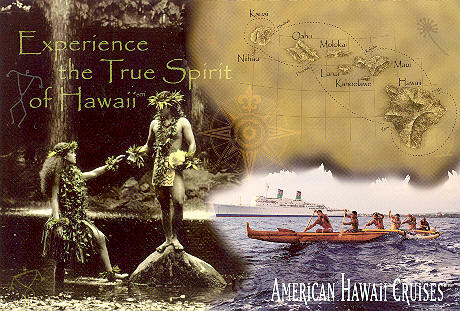 American Hawaii Cruises postcard showing both Constitution and Independence (left). Memories of Hawaii release A-346 showing both Constitution and Independence (right). Memories of Hawaii release A-294 of Independence. Simplon Postcards release sp2042 of Independence, issued November 1993. Photographed Hawaii, by Marvin Jensen. Chantry Classics release CC/S79 of Independence. 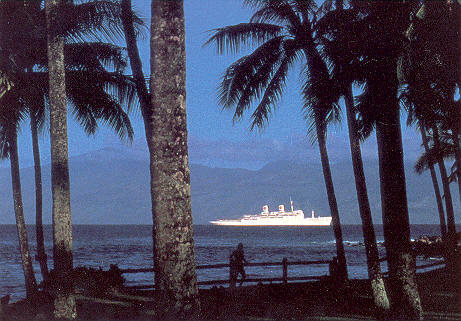 Photographed Honolulu, by Ed Lafferty. 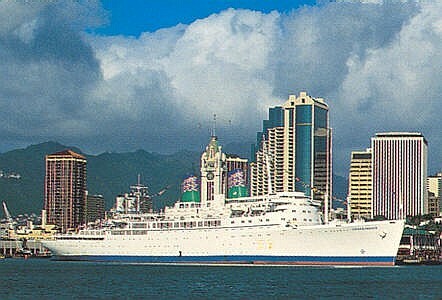 Memories of Hawaii release A-623 of Independence, following rebuilding and repainting. Note the reduced numbers of lifeboats. Photographed by Mark Fay. An enlargement of the ship is shown beneath. An enlargement of the ship from the card above. Phil Mattes release H-1022D of Independence, following rebuilding and repainting. Photographed by Phil Mattes. An enlargement of the ship is shown beneath. Postcard of Independence, following rebuilding and repainting. 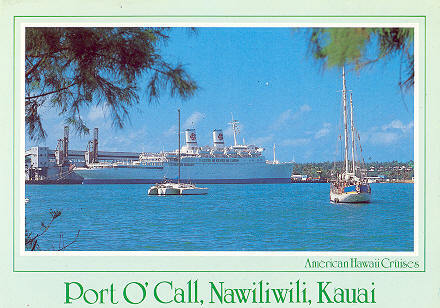 Oversized American Hawaii postcard (serial number AH20794 5/99/kk) of Independence, following rebuilding and repainting. Constitution was the sister to Independence, and entered service on June 6th, 1951. In 1959, both ships received major refits, including the the move of their bridges further forward and upwards. 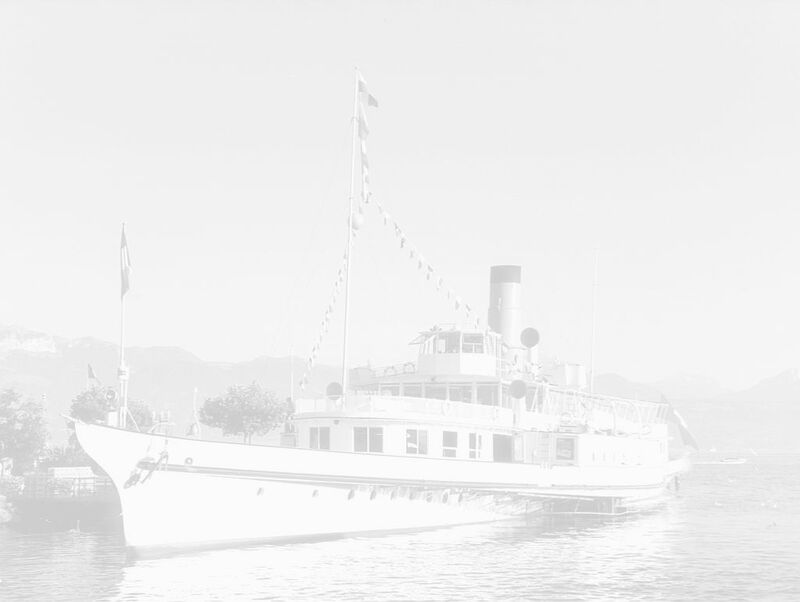 In 1960, the Isbrandtsen Company acquired a controlling interest in American Export Lines, and in 1962 the company name was changed to the unwieldy American Export and Isbrandtsen Lines. Jet aircraft, union problems, plus competition from newer Italia Line ships made the services uneconomic, and Independence was withdrawn from Atlantic service in 1967, followed by sistership Constitution the following year. 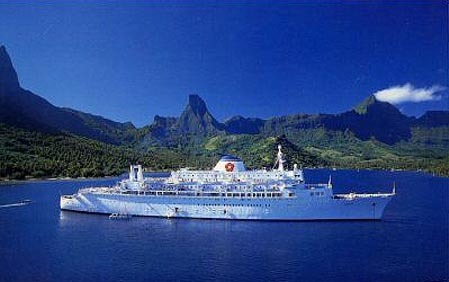 Constitution was laid up until 1974, when she was sold to the C.Y.Tung group and renamed Oceanic Constitution. 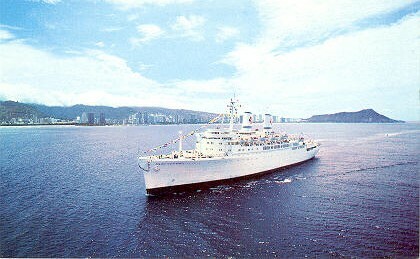 She was laid up in Hong Kong until American Hawaii Cruises were formed in 1980. 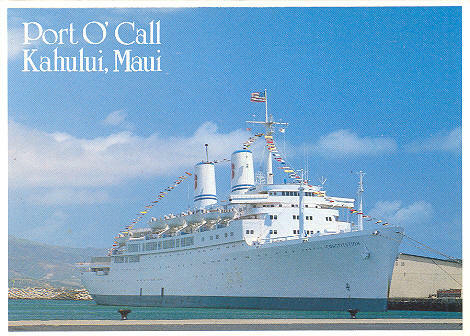 This service started using Oceanic Independence, on 7th June 1980, operating a 7-day cruise out of Honolulu. 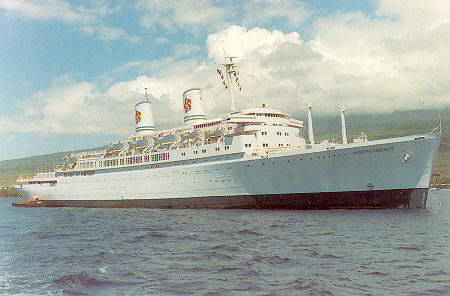 Constitution joined the service in 1982, following a substantial refurbishment. 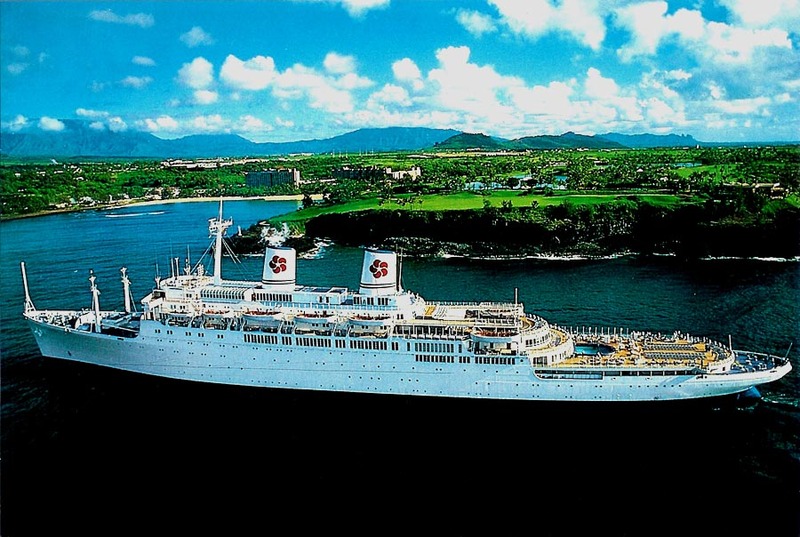 In 1987, the cruise line was bought from the C.Y.Tung group by Peter C.R.Huang for $20million. Constitution was sold for scrap in 1997, after being laid up for two years. She was subsequently lost in the Pacific whilst under tow to the Far East. A complete postcard history and photographs of Constitution is available on this link. 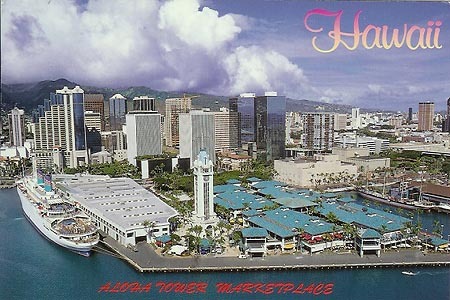 Official American Hawaii postcard SC17992 issued of Constitution (actually Independence). 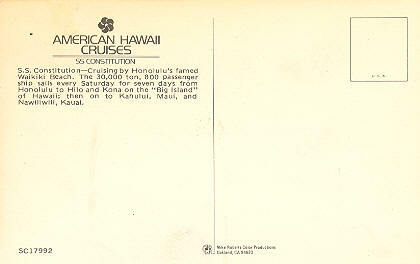 Oversized official American Hawaii postcard of Constitution. 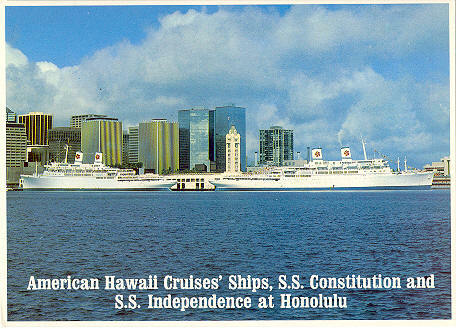 American Hawaii Cruises postcard showing both Constitution (right) and Independence. 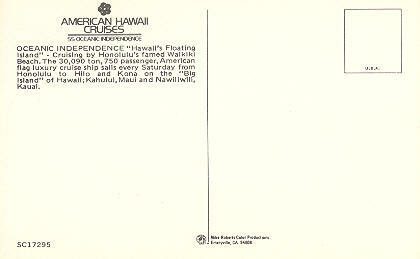 Memories of Hawaii release A-346 showing both Constitution (left) and Independence. 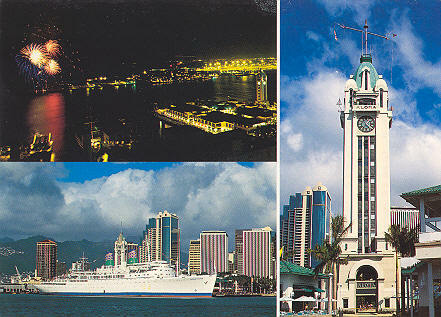 Postcards Hawaii serial number A-293 of Constitution. Simplon Postcards release sp2018 of Constitution, issued June 1992. 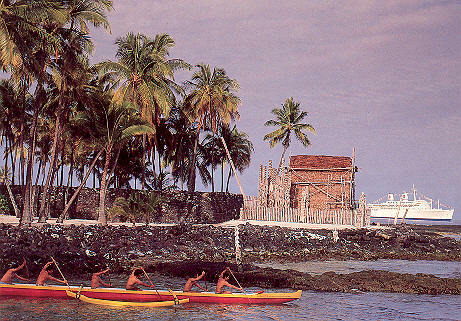 Photographed at Kona, Hawaii, by John Swales. 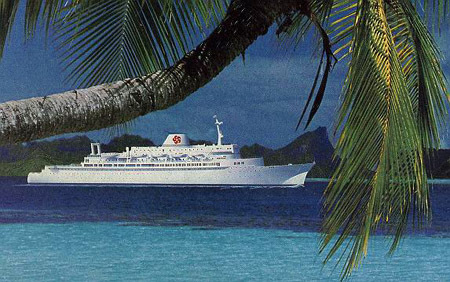 In 1984, American Hawaii entered the Polynesian market with another C.Y.Tung ship, the Liberté, originally the Moore-McCormack Brasil, and later Holland-America Line's Volendam. 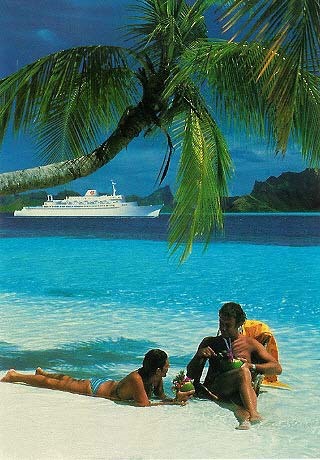 This image of Liberté is from an official American Hawaii brochure. 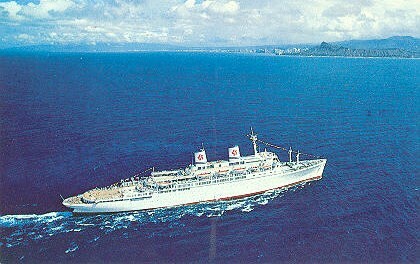 American Hawaii postcard of Liberté.